This is just a short bridge between Masque of the Red Death and Dance of the Red Death, so there really isn't a lot of necessary information in this book (having not read Dance yet, this is an assumption, but I'd be surprised if there was something vital to the overall story in this novella). What we have here, though, are a couple of scenes seen through April's eyes, so it's interesting to get her perspective on what's going on around her. 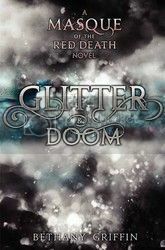 I am anxious to get to Dance of the Red Death. These books constantly surprise me by how much I enjoy them!